Attempts have been made ever since Antiquity to submit the proportions of the human body to a canon or formula. In comparatively recent times Durer made an exhaustive study of bodily proportions which is still valid as a point of reference for modern research. Since no two bodies grow to the same proportions, the search must start with an average of many measurements. From this it is relatively simple to find the individual character of a real body. All research on this subject has concluded that the human body is constructed by and large according to the proportions of the golden mean. This proportion is a division of a given distance so that the smaller section stands in the same relation to the larger as the larger does to the whole. The algebraic formula is m:M=M:(m+M); where "m" = the minor, smaller section and "M" = the major, larger section. This division can be exactly found only in a geometric construction, but it yields an approximate figure of 0.618, which serves as multiplier for the value of the distance to be divided. The result gives the value of the larger section with sufficient exactitude. This theory ought to be understood; though, since calculations and geometric figures are out of place in a freehand drawing, it is enough to judge by eye or to use the simplest measurements, with folded strips of paper or a pencil held out to mark off distances. This technique should be mastered, for it is essential to be able. to divide distances. More theory: the Fibonacci series in which each succeeding number is the sum of the two preceding ones yields increasingly close approximations to the golden section: (1:1, 1:2) 2:3, 3:5, 5:8, 8:13, 13:21 and so on. It is close enough to stop at the proportion 3:5, according to which 8 (3 + 5) can be divided easily according to the golden section. If a length is 176 inches, an eighth is 22 inches (5/8 - 110" + 3/8 = 66"). Of course, no figure drawing is started by making a series of measurements. All we need to do is to mark down the height from the standing line to the crown, and then to halve it. These divisions are halved again, and yet again until the height is divided into eighths. The third and fifth sections divide the whole height by golden section. Ever since antiquity the following rules have been valid: the human head, measured froom the under edge of the chin to the top of lhe crown without hair is an eighth the length of the whole height of the body. The navel is at five-eighths of the height of the body from the ground. If this distance is again divided according to the golden section in a relation of 3:2 it meets important lines of proportion on the shin. 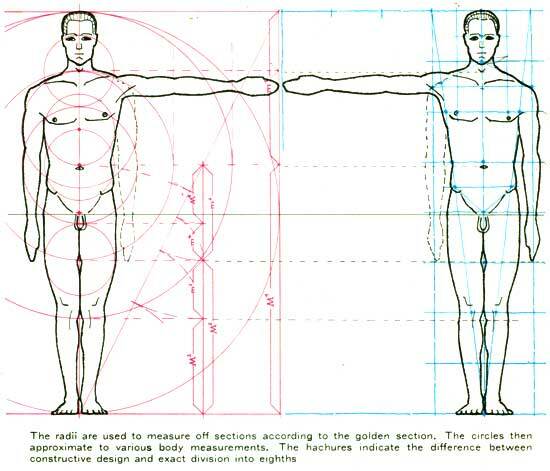 The diagrams show how divisions into eighths mark out other important points on the body. The proportion 3:5 is not far advanced in the Lame series and is, therefore, not very exact. A multiplication of 176 by the index 0.618 arrives at 108.1. This makes a difference from the division into eighths of 1.4. The practical effect is that the navel has to come very slightly lower than the five-eighths line, a correction which can be made by eye. 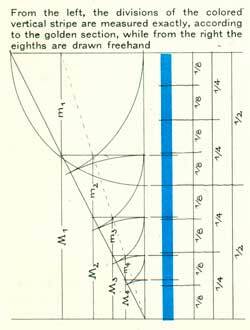 The drawings illustrated side by side show a comparison of the exact and rough schemes, demonstrating that the latter is perfectly adequate for freehand drawing, The exact scheme can be arrived at only with compass and set square, and these have no place in an artist's equipment. The difference is so small that a scaffold of 16 squares is perfectly satisfactory. It is quite sufficient to draw this scaffold freehand and by eye. Some other measurements are of use. The two diagonals from the standing point to the corners of the complete double rectangle have been found to touch important points, though they bear no relation to the golden mean. Neither do the two outside lines of a rectangle formed by one-eighth squares on either side of the center axis; but these are easy to find and give useful indications for the breadth of the body. If the upper four squares are divided into sixteenths, the lines are valuable for finding the proportions of the head as a basis for the shoulder triangle and for the distance between the breasts. Another division into sixteenths in the fifth squares will give the triangle of the pelvis. Unlike many other guiding lines this one is not altered by movements of the body, as the pelvis is rigid within its own bone structure. No guiding lines can do more than give points of reference for comparing with the model.